Growing demand for health services and declining productivity will result in millions more health-care jobs by the end of the decade -- regardless of how the U.S. Supreme Court rules next week on "Obamacare," a new Georgetown University report shows. The demand for workers within the health-care industry is expected to grow by 3 million to about 13.1 million by the end of the decade, up from slightly more than 10.1 million in 2010. Adding in "replacement jobs," those left open by retirements, deaths and resignations, Georgetown researchers forecast the number of jobs to grow nearly 30 percent to 5.6 million by 2020. Despite legal challenges to the the president's health care reform law -- formally known as the Patient Protection and Affordable Care Act -- Georgetown researchers concluded that the law will have a "negligible" effect on the growth in the number of health care jobs. 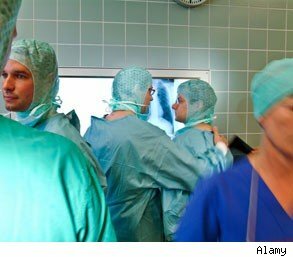 The study's projections show that health care reform's implementation would "shift some jobs around inside health care," but lead author Anthony Carnevale says that the law's impact on employment levels is likely to be minimal simply because the sector is so big and growing so rapidly. "It doesn't affect the industry that way," Carnevale told AOL Jobs in an interview. Where there is likely to be an impact is among those holding or pursuing jobs as nurses. Nursing is becoming an increasingly educated profession, especially among younger workers. People of color have been well-represented in the sector, but greater educational requirements may result in some minorities being pushed out. The study found 51 percent of white nurses under 40 have bachelor's degrees, compared to only 46 percent of Hispanics and 44 percent of African-American nurses. The industry has the largest number and proportion of foreign-born and foreign-trained workers in the U.S. The report finds 22 percent of health-care workers are foreign-born, compared to 13 percent of all workers nationally. Most foreign-born nurses come from the Philippines, India and China. White males still hold most of the high-paying jobs. The report found 81 percent of dentists are white men. Just 30 percent of doctors are female. While most of these occupations have modest educational requirements, only 20 percent of health-care professional and technical occupations earn less than $38,000 a year, and nearly 50 percent earn more than $60,000. The Future Workplace “Multiple Generations @ Work” survey asked 1,189 workers across the generations how likely they thought they were to work past age 70. Seventy-seven percent of baby boomers (between ages of 48 and 66) said they believed they would work into their 70s. What is surprising is that 82% of Gen Xers (between ages of 36 and 47) agreed. There are a number of reasons for employees to believe they will be working longer. First, they are already living longer. Boomers are expected to live longer than any previous generation of Americans. Of the 3.4 million born in 1946 — including Bill Clinton, George and Laura Bush, Donald Trump, Susan Sarandon, Steven Speilberg and Sylvester Stallone — 2.8 million are still alive. The men can expect to live another 22 years, the women another 25. And since we are living longer, we may want and need to work longer – especially to meet the financial needs caused by sagging retirement accounts, and plunging property values. As careers get longer, workplace culture will have to accommodate age diversity. Some traditionalists (those 66 and older) and baby boomers are already working further into their 70s and 80s, so as a new batch of employees from “Generation 2020″ (born after 1997) graduates from college and joins the workforce, it will become common to find five generations working side by side at the office. These questions can seem irreverent, but managers must understand what’s really behind them. The applicant who asks if he has to show up each day is really inquiring about the company’s telework policies and flexibility. The applicant who inquires about her ability to bring her own devices to work each day is really asking if the company has a Bring Your Own Device (BYOD) to work policy in place to allow employees to use their own devices instead of company-owned, standard devices. Be aware of each generation’s preferred learning and communication styles. Google provides a good example of how to use games to boost productivity. Google‘s management realized that the company’s large spread of office space was cutting down on human interaction. To help foster connections, the company built an online, multiplayer social game called GoCrossOffice, modeled after the game Risk. Players collaborate, organize and socialize with each other, and in the process, strengthen their team-building and strategic-thinking skills. Since then, other companies have joined in this trend, too. Don’t believe the myths about each generation in the workplace. For instance, flexibility has become an increasingly valued workplace characteristic by workers of every generation. When Future Workplace asked how important a flexible work environment was, 35% of our survey respondents, across all ages, answered either “important” or “very important.” For all generations, flexibility –flexible hours and flexibility of location (i.e., telework) – was more important than both compensation and opportunities for advancement. In our survey, 66% of millennials agreed with the statement, “my personal drive can be intimidating to other generations in the workplace,” and the generations’ divergent views on what to expect in the workplace of the future further outlined that tension. A study by PricewaterhouseCoopers found the same.